BEST known for its range of gourmet burgers, The Daily Grind in Bangsar Village now offers a delectable brunch menu on weekends. 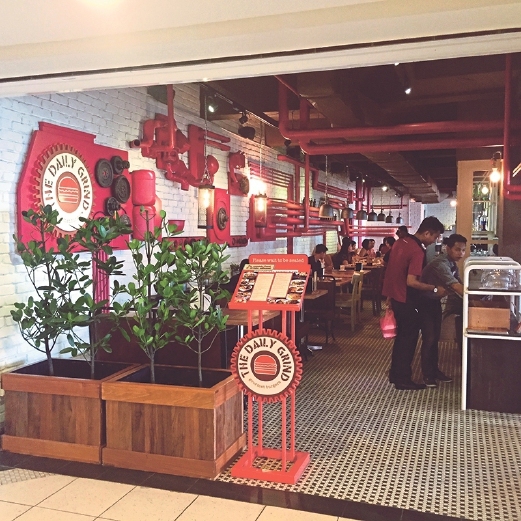 While it does offer pasta, salads and main courses such as steak, fish and chicken, there was always this “between time” on weekends, especially for customers who want a bite before they do their grocery shopping. The brunch menu officially started late last year we couldn’t wait to get a first taste. First thing I notice is the wide range of dishes. With eight choices, a coffee is much needed to wake up the brain cells. And TDG serves a mean coffee too. But I am eyeing their milkshakes, especially the house specials such as espresso, malt and peanut butter, banofee pie and chocolate fudge. If you must have sausages, there are two in Napoleon & Churchill (RM25). The juicy chicken sausages have great texture and come with crepes, cheddar cheese, romesco aioli and rocket salad with apple slices. I pick Smokin’ Seaside Scones (RM28) as I haven’t had savoury scones in a while. The crumbly onion scones come with two perfectly poached egg topped with hollandaise and rocket as well as slices of smoked tuna and smoked snowfish which elevate the dish to gourmet standards. While the above are hearty portions, it gets heftier with Waffle & Chicken (RM22) for those who need their meat ration early. A spicy tomato chutney perks up the fried deboned chicken thigh while the waffles are best with maple syrup. And of course, there’s burger. For the Burger Me Breakfast (RM27), a brioche bun is halved and sandwiched with a beef patty, hollandaise, rocket and tomato jam. It seems some people cannot crankstart their day without sugar. I find coffee does a great job there but if you must get sweet, the Pancake Souffle (RM23) is a real treat. Three light fluffy pancakes are stacked 18cm tall, with lemon cream oozing from between the layers. If that’s not enough to make the heart skip a beat, you’ll drool over the wild berries, chopped chocolate and nuts. I think the chefs are having fun in the kitchen, creating works of edible art. I love the healthy Goddess Bowl (RM22). The house-made Vietnamese-style yoghurt surrounded by berries, pumpkin seeds, mango cubes, goji berries, oats, coconut flakes and mixed berry coulis, with edible flowers giving it a summery feel. Then there’s The Mockery (RM18). I had to rub my eyes and take a second look. What looks like bacon, eggs and sausages with hash browns turns out to be pancake, lemon curd on whipped cream and grilled banana and fried apple pie respectively, served with waffles and maple syrup. It’s a dessert version of classic English breakfast, guaranteed to tickle kids’ fancy. The young ones will also love Captain Morgan’s French Toast (RM23) which is topped with panfried banana, rum and raisin ice cream, chopped pistachio and maple syrup.